The decision on whether or not dogs are permitted on a Ramblers walk has been devolved to Areas, then to Groups and then to individual leaders themselves. Dogs may be permitted on some walks where there is no problem with terrain or livestock or if the leader themselves is comfortable with dogs. 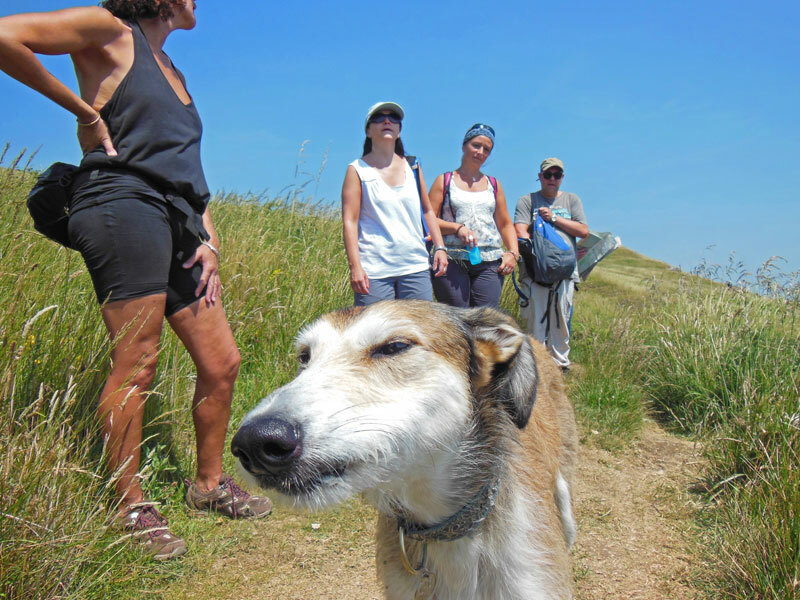 Some groups have made the decision not to allow dogs on any walks but we would encourage groups to allow dogs wherever possible at is often the case that people join Ramblers in order to walk with their dogs and like minded people. Some Groups have trialled dog friendly walks and found them to be very successful, both boosting the number of members and helping promote the diversity of Ramblers walks. We recommend that dogs are kept under close control and kept on a lead on roads, near livestock or sensitive wildlife, where the terrain requires careful footwork and wherever the law or other official regulations require it. The only exception to this rule is in the event of walkers being threatened by cattle (they can become unsettled by the presence of dogs). In that circumstance dog owners are advised to release the dog from its lead – the dog will be able to run away and the cattle’s interest will be diverted from the walkers to the dog. The Coastguard reminds dog walkers to keep dogs on leads near cliffs. “There are so many exciting distractions for dogs in coastal walks that even the most docile dog has been known to go over cliff edges”. Dog owners must ensure their dog does not alarm other people and they must clean up after their dog. We encourage walk leaders to remind dog owners of their responsibilities at the start of the walk. Dogs on walks do not affect the insurance cover in any way and incidences caused by dogs are covered by the insurance policy, as long as the activity is a recognised Ramblers activity. Please note under the Disability Equality Act (2010) the wording of ‘no dogs’ on walks programmes is in breach of the Act. The Act covers in-direct disability discrimination; this occurs when there is a policy or practice which disadvantages people with a disability. An example from the Act is a ‘No Dogs’ rule which particularly disadvantages assistance dog users. Therefore an organisation is required to make reasonable adjustment to this rule to ensure that no disadvantage occurs. Under the Act, these dogs must be allowed to walk with their owners. If Groups, Areas or Walk Leaders do not wish dogs on their walks they must state “Registered Assistance Dogs Only”. Members of the Ramblers can walk with any group of their choice and some may be more welcoming of dogs than others. To find a group that accepts dogs, please check our Walks Finder pages on this website. However, not all dog friendly walks are listed so it is wise to check with the leader if they are allowed or not. It is very important that the local Group or Walk Programme Co-ordinator makes it very clear in advance to all members or potential walkers when a dog is not welcome on a particular walk. It would be unacceptable for members with dogs to turn up for a walk and be turned away.